UPDATED: MAR 20, 2019 Draft at the Zig Zag Bar in Paris, France This bar is near the University of Paris with an excellent selection of beers. The IPA poured a clear amber color with a white foamy head and lacing. The aroma of floral hops and lemon zest greets you. The taste had more lemon zest mixed with grapefruit and, pale malts. Nice ale with a knowledgeable barkeeper. The ale has a medium body with average carbonation. This was one the best beers I had in Paris. UPDATED: JAN 29, 2019 330ml bottle. Clear, orangey golden colour with huge, thick, creamy, mostly lasting, moderately lacing, white head. Sweet-ish, caramel malty and slightly grassy and citrusy, hoppy aroma, hints of instant lemon tea, a spicy touch of hay. Taste is bitter, grassy and citrusy hoppy, weak caramel malty basis, hints of lemon, instant lemon tea, fresh hay, a strawy touch; slightly overcarbonated. UPDATED: DEC 7, 2018 Bottle @ home. Golden colour with a medium sized white head. Smells hops, grassy, malts. Tastes hops, grassy, malts, yeast, herbs. Medium body, medium carbo. Thuis uit een flesje, lelijk etiket. Mooie gouden kleur, licht beige schuim. Prima hopsmaak met een goede nasmaak. Aroma is wat flauw. Dorée foncée-ambrée, attaque sur amertume, première finale douce ronde, puis pointe sèche agréable qui accroche un peu. Rien de vraiment singulier mais sympa. 50cl à la pression au bar La Tête à l'envers, Vincennes, France, bue le 06/09/2017. 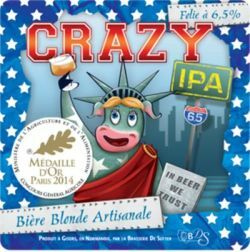 Pour moi cette ipa n'a rien de rare. En fait, c'est plutôt une bière de style belge qu'une ipa tant la levure domine. Non, vraiment rien de fou. The beer has got a hazy amber colour with a steady head and medium body. Aroma of hops and pine. taste of hops, citrus fruits, herbs, pine, melon and flowers. Hoppy finish. Nice. (Rouen - La Porte Ouverte) Une IPA normande de bonne facture qui n’abuse pas du goût d’agrume. une belle découverte.